We ask that you pre-register for the dinner at your earliest convenience online at www.torontoashrae.com, select “Meeting Registration and Calendar” from the left tab and then “Register” button for the ASHRAE Toronto - October 2011 Dinner Meeting. You may also still register through the ASHRAE chapter office (Sabrina Tai - 905 602 4714 or stai@hrai.ca). Please indicate at time of registration if you have any specific meal requirements. There will always be a vegetarian option, simply notify us at time of registration. No walk-in registrations will be permitted for this event. 2011 ASHRAE Toronto’s first dinner meeting will be based on Student Promotion theme and will be held at Ryerson University to showcase their new Student Learning Centre. Ryerson is one of the largest academic institutions in Toronto. It is located in the heart of downtown Toronto with notable landmarks such as the Ted Rogers School of Management, George Vari Engineering and Computing Centre, Sam the Record Man, and Maple Leaf Gardens. This year, Ryerson has announced that they will be adding a new Student Learning Centre. The building design, which was collaboration between Zeidler Partnership Architects of Toronto and Snøhetta of Oslo, Norway and New York City, well reflect Ryerson’s bold and innovative character. The 155,463 square-foot, eight-storey learning centre will feature bright, open, sustainable environment, which will provide an outstanding atmosphere for students to study and engage with one another. A variety of learning environments, digital support and academic services will promote student learning success and help foster a culture of collaboration and creativity. In the grade and below, Destination retail space will be available, creating a prominent commercial façade to Yonge Street traffic. In essence, the building will be its own neighbourhood. It will be a place of interaction, introspection and discovery for the Ryerson community. 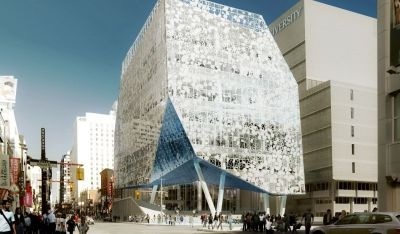 Ryerson University’s new Student Learning Centre is targeted to be a LEED NC (Leadership in Energy and Environmental Design – New Construction) Silver rating with at least 50% of the roof to be a green roof. The Student Learning Centre will be substantially completed in Winter 2014. Construction will begin in late 2011. Crossey Engineering Limited has completed the mechanical design for the new Student Learning Centre. Crossey is a multi-disciplined consulting engineering firm, headquartered in Toronto, Ontario, and has been providing professional engineering services since 1963. They have worked on projects across Canada and around the world, in various industries and sectors, including: Public, Healthcare, Manufacturing, Peforming Arts, Gaming and Education. Hossain Khoee, P.Eng & LEED AP, is a Principal at Crossey and will be providing ASHRAE members and guests with an overview of the Mechanical and HVAC design characteristics of this facility. As the theme of this dinner meeting is Student Promotion Night, ASHRAE Toronto would like to extend this notice of meeting to all interested college and university students. Students can register for this event at a discounted rate of $20 and an ASHRAE membership (both Society and Chapter) is not required for students to attend. However, registration is still required and no walk-in registrations will be permitted. Don't forget to take advantage of the limited time Prepaid Meal Plan offer for ASHRAE Toronto Chapter members. Click here for more information!